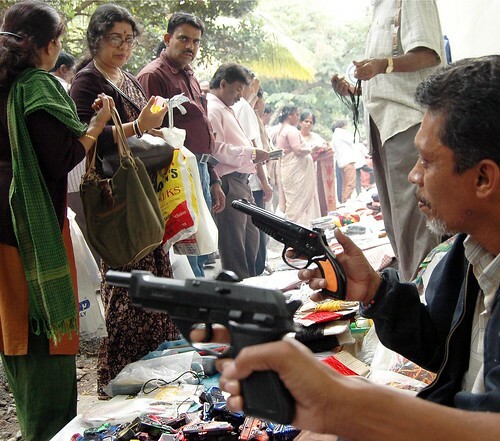 Sharpshooting, smooth talking cracker salesmen test their marketing skills on customers with toy guns on the eve of Deepavali on Cubbon Road in Bangalore on Thursday. This entry was posted in Mysore-Bangalore, People and tagged Churumuri, Deepavali, Diwali, Lord Cubbon, Sans Serif. Bookmark the permalink. The gun in the hand of the salesperson looks exactly like browning 9mm. The manufacturing and selling this type of toys should be banned. There is every possibility of a police officer taking defensive action if a young boy in a troubled locality points a toy gun like this at him. Happy Deepavali to all our friends and wish you all a very Happy Blogggging! Wonder what the history of the ‘cape-in kovi’ is (the ones which take a ‘reel’ of the gunpowder dots and makes a chat-chat sound)? Anyone knows when they first started selling in the cracker stalls? It is the beggining of those dreaded time of the year where noise and smoke pollution will reach its high. What is celebration for some is dreadful and traumatic for old and ailing people, pets etc. As a nation we do not have any civic sense. We do not how to celebrate joyous occassions without disturbing the peace and tranquility of the other people. We are dangerously insensitive. I agree with you. Such kind of toys should be banned. In any case road side stalls/carts should not be alllowed to sell on busy roads . It is going to distrupt the traffic and add woes to already troubled traffic scene. If they are allowed to sell, they should get licences and pay some money. hey, has anyone tried spending money on candles instead of on crackers n then putting candles on every nook and corner of the house, i mean chajjas, window sills terrace walls, basically candles on evry external part of the house(of course with some gap in between candles). I tried it once and it looked beautiful, me n my sis stopped buying cracker n had been doin that ever since(about 6 yrs now)…but alas im in germany for studies now and am missin the deepavali spirit. Can anyone do something like this, make a photo and put it up on churumuri for the festive occasion? Very nice headline. Very apt indeed. Anna, Tamma, Bhai and Brother yellarigu Deepavali habbada subasayagalu! I am afraid that those pistols and so-called guns would be there before they reach homes?